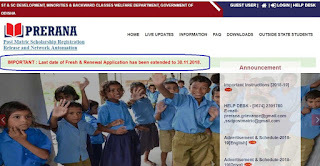 Odisha Prerana Scholarship 2018 Last Date- Odisha Prerana Scholarship 2018 last date for application or renewal extended notification released at Prerana Official website. For more details, you may go through this post. Here is good news for all who are not able to apply Odisha Prerana Scholarship 2018 that one more chance to apply for new registration (fresh) or renewal applications. 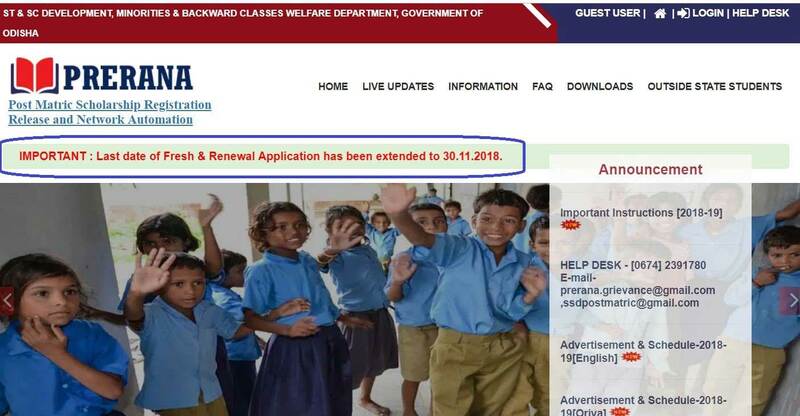 In the official website of Odisha Prerana Scholarship, a notice has been released regarding the Odisha Prerana Scholarship 2018 Last Date that the Last date of Fresh & Renewal Application has been extended to 30.11.2018. Odisha Prerana Scholarship 2018 Last date of Fresh & Renewal Application has been extended to 30.11.2018 instead of 15.10.2018. I think due to a technical problem of Prerana Portal the date has been extended. Last few days students cannot submit their applications at Prerana Portal, they are facing problems to register and to get OTP. Students have to wait till resolving this problem at the official website. 6. Students must be in class +2 or above. Click on below link to know the process of new registration and full details steps to apply Odisha Prerana Scholarship 2018. Note: Please visit the official website of Prerana Portal for correctness regarding Odisha Prerana Scholarship 2018.